12-May-10 Version 1.0 beta released. 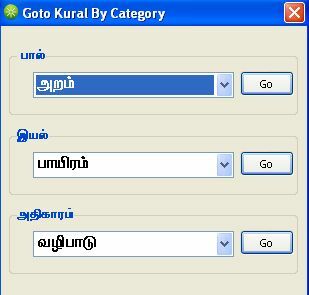 Daily Kural is a software which is used to display a Thirukural and the tamil and english meanings. Thirukkural constitutes one of the most important literary works in Tamil (Dravidian language of southern India). 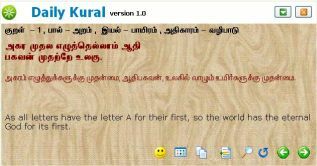 It is generally reckoned that Kural was composed during the Sangam Period of literary development in Tamil (500-200 BC). Thirukural was composed by Thiruvalluvar. Thirukural is a work of 1330 couplets each of which conforms to the structure of "Kural Venba", a grammatical construction with two lines of four and three words respectively. The work is arranged in 133 Adhikarams, each with 10 couplets. The 133 Adhikarams are divided into three major groups known as "Aram", "Porul" and "Inbam". Aram represents Virtue, Porul defines the principles of Life for common people as well as the State. The last section deals with aspects of Love. Thiruvalluvar is a one of the greatest Tamil poet, who lived 2000 years ago and described the life and the life style very practically in Thirukkural (One of the oldest and most revered poems in Tamil). Thirukkural is regarded globally as its ethics are highly valued for making the life better and applicable forever. Not much is known about Tiruvalluvar, the author of the work though it is believed that he was born in Mylaopore (Chennai, Tamilnadu) and belonged to the weaver community. 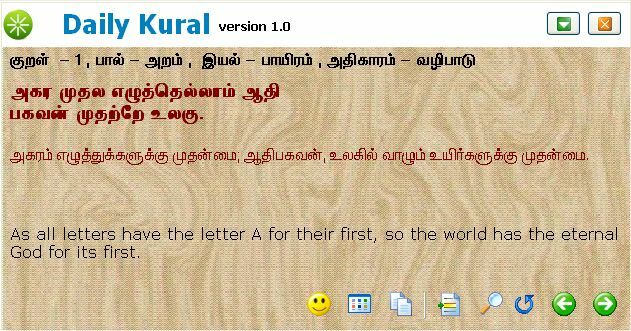 Go to a specific kural. 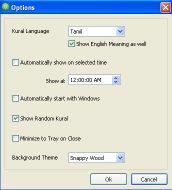 Auto launch of kural on windows startup. 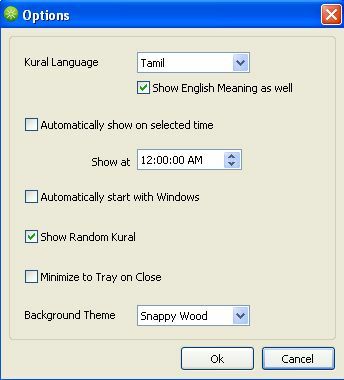 Automatically show a kural at a particular time. No active internet connection to view all the Thirukurals except for the initial download and install. 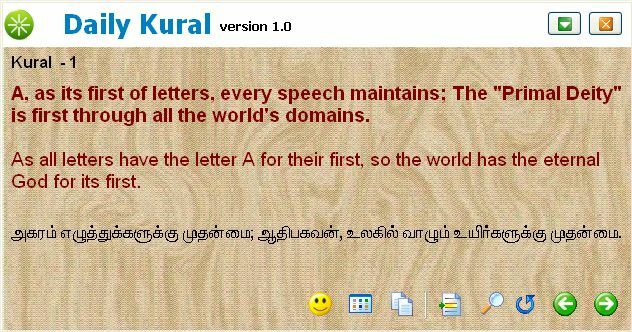 Dailykural is freeware. You may use this software on any number of computers for as long as you like, and you don’t have to pay a penny. You may not remove my name or copyright notification, and you may not claim to be the owner or author of this software. You understand and agree with this license and with the disclaimer printed below. While every care has been taken to ensure that Dailykural is safe, non-destructive and will not lose your data, you use this product entirely at your own risk. The author will not be held responsible or liable for any damages resulting from your use, misuse, or inability to use this product. If you do not agree with this disclaimer or the above conditions of use, you should not use this product. Your feedback is important to us. If you have any question, comments, or bug reports, please feel free to contact us at info@dailykural.com . The source of the Thirukural database was from the websites http://dmk.in and http://www.tamilcanadian.com Also thanks to all the beta-testers and users.